The adoptable pet of the week from the NY ASPCA is this beautiful cat : Groucho. 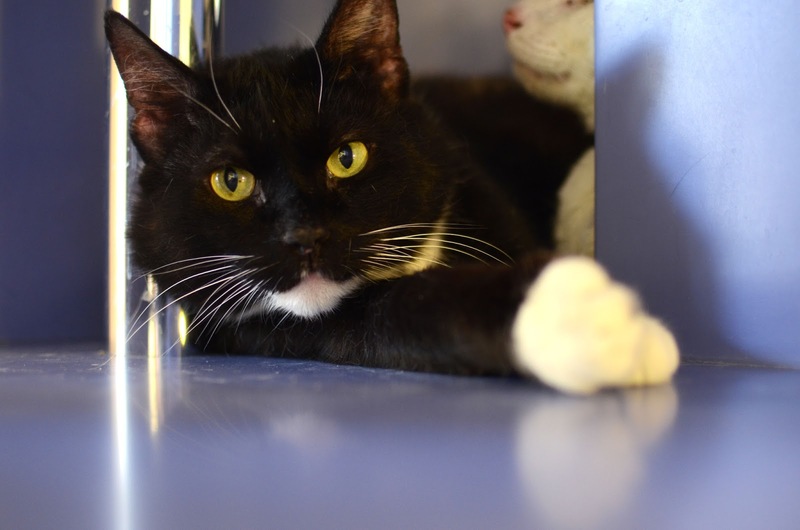 Groucho is a 3-year-old domestic shorthair mix who was rescued from a hoarding situation. He is a bit of a nervous cat and can be conflicted about whether he trusts people. He truly wants to be one of those happy-go-lucky kitties, but can’t seem to get past his fears. Once he learns that you are friendly and won’t hurt him, he will start to relax and come out of his shell. This sensitive feline needs a family who will go slowly with him, and be patient when it comes to showing his true colors. Groucho is bonded with his best friend Marine, so they must be adopted together. Groucho would do best in a quiet household with an adopter who has previous cat experience. Groucho is neutered and up-to-date on all vaccinations. Please if you know anyone who wants a lovely cat or two, head over to the ASPCA and find Groucho or another cat for you! I would love to see all of these loving animals find a happy home.